A universal packing, using lubricated polyimide filaments to produce a unique grade able to perform reliably in a wide range of services and equipment. Ideal slurry packing. K4333 is only one of the extensive products in the KLINGER pump and valve sealing range. The range includes compression packings, moulded sets, low emission sets and specialised products. Ongoing Test & Development in line with the KLINGER service and quality philosophy will ensure improved performance in your pump and valve applications. The base yarn of K4333 is composed of synthetic polyimide filaments which have excellent mechanical properties in terms of overall strength and elongation. It is manufactured by the Klingerlock braiding process, during which we add an additional PTFE based lubricant. This enhances the packing’s performance in dynamic applications. The polyimide base structure of K4333 ensures the packing has excellent temperature resistance. Normally low gland loads will achieve a satisfactory seal. 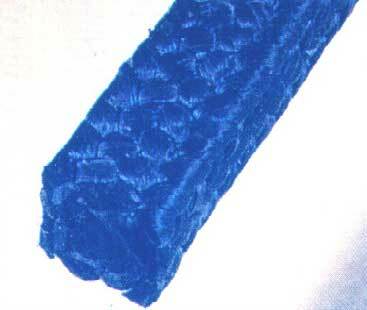 Where shaft wear is a problem, K4333 can be employed as a good alternative to aramid , (ie. yellow fibre) , based packings. In practice it significantly reduces wear rates when compared to many other packing types and is the best performing slurry grade within the range, offering long life.